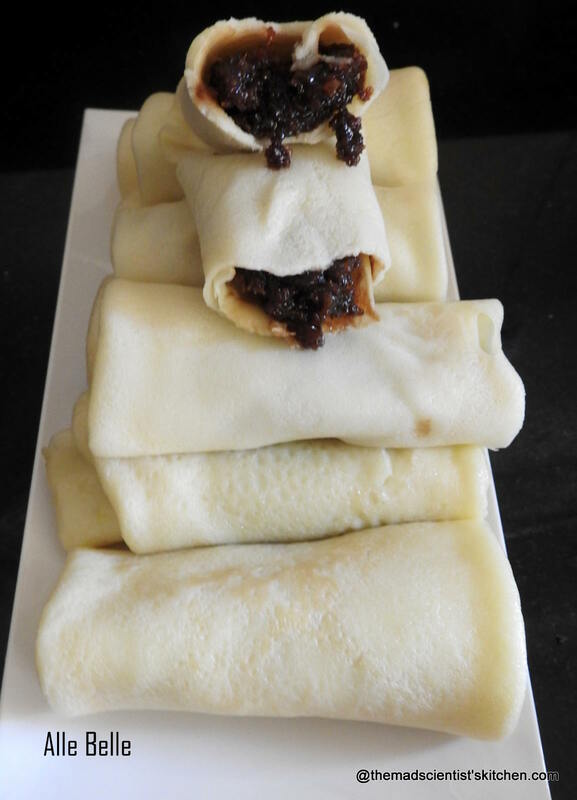 Alle Belle is a delicious sweetened Goan Pancake stuffed with of course coconut and jaggery. 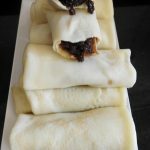 The jaggery used is palm jaggery, dark and highly nutritious. This simple yet delicious dish is relished in Catholic families. Like most of the old favourites, this one is slowly disappearing. So I thought I will share it here. In Goa, sweets are preferred with afternoon tea. After eating Alle Belle or allebelle with my tea I agree with the Goans. I bought the jaggery in the market and hubby was not happy. When he was fast asleep in the afternoon I made these. The aroma I will like to believe woke him up and he enjoyed the pancakes. Needless to say, he was very enthusiastic about pancakes and ate most of them without complaint. 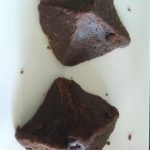 I think it will work for regular jaggery too but you will not get the dark colour and the flavour will be a bit different. 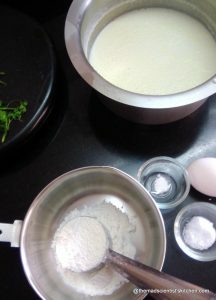 The main ingredients for the pancakes are Maida/APF, eggs, milk, salt and baking powder. You can add food colour too if you wish. 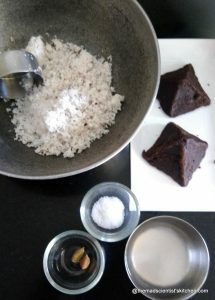 The main ingredients for the stuffing are freshly grated coconut, palm jaggery, salt. 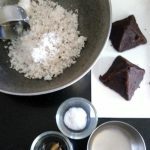 In a pan, add the coconut, jaggery salt, and 1/4 cup water. 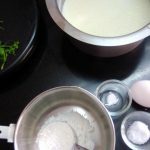 In a bowl, add flour, salt, egg and baking powder. Add milk as needed to make the batter for a thin pancake. Grease a small skillet with ghee. Pour a little batter into the pan. Swirl the pan to spread the batter in the pan. Add the stuffing and wrap the pancake around the stuffing. Make the next 8 pancakes in the same way. Do not stack the pancakes on top of the other. This is the way to wrap the stuffing. Stack them and serve with a cup of tea. I found the mixture a bit salty reduce the salt in the stuffing. You may add food colour also to make colourful Alle Belle. A simple yet delicious Goan treat with tea! I got 9 pancakes you can get about 12. Fantastic one Arch, this sounds so much like the Bengali Pati Sapta…I am sure I will love this..
Looks great.. surely very tasty. Now I understood what is that sweet. My friends do bring these a lot and share with us. But never knowing what are they actually and called. That is a fantastic filling for the pancake. Love it. 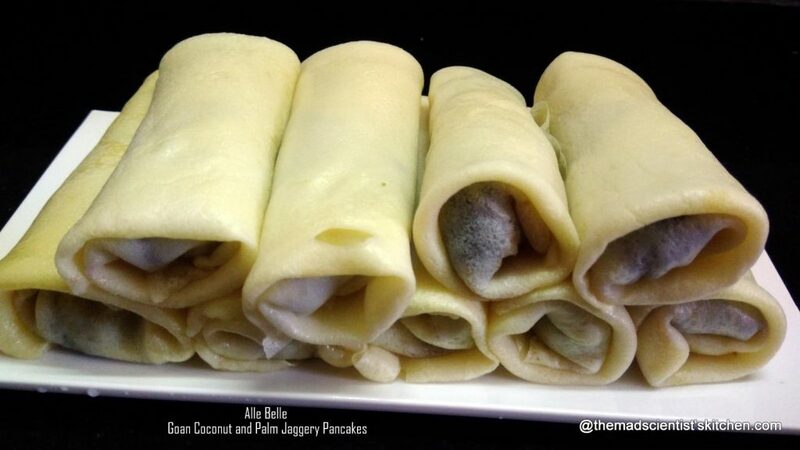 Am in love with the filling and this alle belle rocks, such a lovely pancakes. Kudos for the entire effort. The dish has comeout really well. Great clicks too. Coconut and jaggery is the match made in heaven. The pancakes look so yummy with it. Looks delicious arch! cute shape of the palm jaggery! Filling sounds droolicious ! 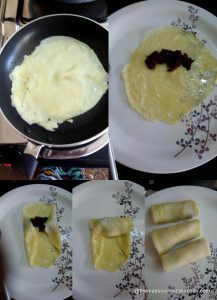 Will try an eggles version pretty soon! Pancakes look fantastic with that stuffing . Lovely combo . 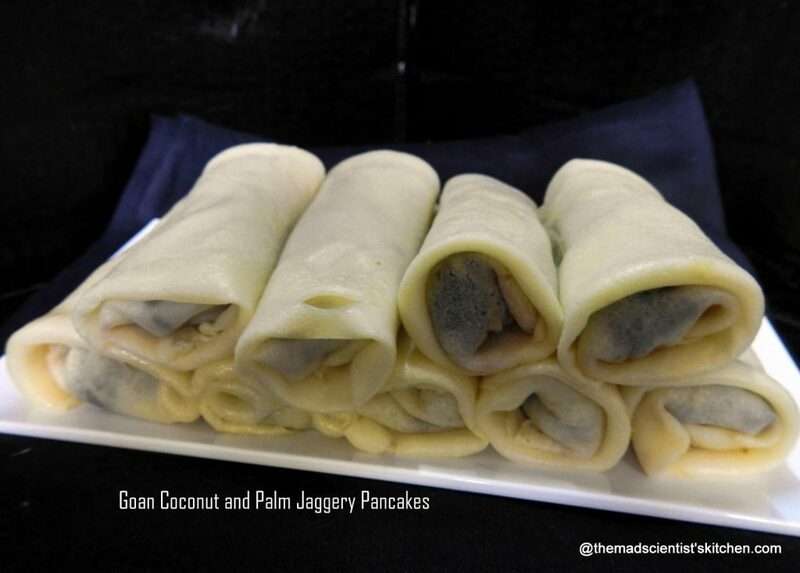 I wish I can find palm jaggery here, loving these mouthwatering Goan pancake with palm jaggery filling. Addition of coconut everything makes so rich and nice. Thanks, Jagruti. I am sure you will find it in UK there is a big population of Goan Catholics there. Kids would love these for breakfast.Super like. Absolutely delicious filling.. Heavenly combo !